The Greek government has given Financial Relations Minister Euclid Tsakalotos the lead in negotiating with international creditors. The Syriza-led coalition says the team headed by Finance Minister Yanis Varoufakis has failed to produce results. The Athens government announced the decision on Monday. Tsakalotos will represent Greece at the next Eurogroup meeting of finance ministers on May 11, a landmark date for Greece as the government has to persuade the Troika of lenders –the EU, ECB and IMF to release new funds. It is hoped the economics professor will take a more active face-to-face role in negotiations with Greek creditors. Greece’s economic team headed by Varoufakis has been trying to find a compromise with the troika for about 3 months, since Syriza won the general election at the end of January. So far the economic plans presented have been criticized for a lack of detail. 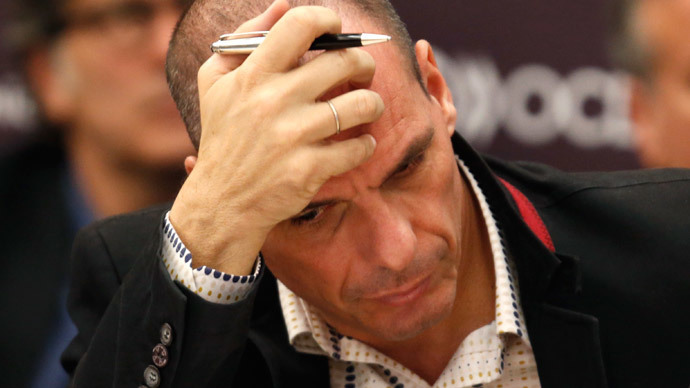 Reacting to the news a senior European Union official told the Guardian it was ‘impossible’ to deal with Varoufakis. “It had got to the point where eyes roll,” he said. “People had got sick and tired of being lectured about austerity and the effects of the crisis. Any sympathy for Greece was eroded by his failure to draft concrete proposals,” the EU official said. By sidelining Varoufakis from negotiations with European creditors, Syriza is calming down its anti-austerity stance, James Meadway, senior economist at New Economic Foundation, told RT. “What this reshuffle suggests, when you have Euclid Tsakalotos taking more of a role in the negotiations – he’s very pro-European, very pro-euro – it suggests the Greek government is inching away from its hard-line austerity position,” he said. Greece needs to get about €7.2 billion from Europe to pay outstanding debt. Should Athens fail to get the money, the country could default in May. This could force the country to leave the euro, which could then create a domino effect across Europe.